Check out these quick and easy recipes, some containing 5 ingredients or less. All tasty and all perfect on a brunch or luncheon buffet menu. The simple serving suggestions will have your guests thinking you've cooked all day! Try with equal amounts of chicken wings. Serve with cherry or grape tomatoes and limes for a pretty presentation. Recipe easily doubles or triples. Preheat the oven to 350°F. 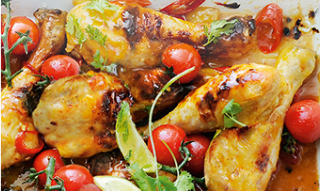 Place the drumsticks in a 9x13-inch baking dish and toss with the mango chutney and red pepper flakes. Bake for about 1 hour on the middle rack, turning halfway. Quarter the limes and coarsely chop the cilantro. Remove the dish from the oven, toss with the tomatoes, and garnish with lime wedges and fresh cilantro. Punch one hole in each can of juice with a can opener and freeze juices in the cans. Remove juice from freezer 1 hour in advance, or sit cans in a sink of warm water for 10-15 minutes. It should be slushy. Mix up in large punch bowl and serve. Cut cheese into 3/4 inch cubes. Combine the remaining ingredients, preferably in a glass container. Add the cheese cubes and toss to coat. Cover tightly and refrigerate at least 4 hours to let the flavors blend. Skewer 1-2 cubes on a toothpick. Place on serving platter and pour any remaining marinade over all. Separate the 8 crescent roll triangles. Mix the sauce and the chicken, and divide the mixture equally among the triangles. Pinch closed the triangles so that chicken is completely surrounded. Bake for 20 minutes at 375. Microwave broccoli tops for about 1 minute or until slightly softened; cool (optional). Toss broccoli, bacon, and cheese. Chill. In separate bowl combine dressing ingredients. Heat 3 tablespoons of the oil in a large sauté pan over medium-high heat. Add the garlic, red pepper flakes and the nutmeg. Stir and cook the garlic mixture about 30 seconds. Add the spinach and cook, stirring and tossing until the leaves begin to wilt and all of the water has evaporated, about 5 minutes. Add the remaining olive oil and some of the lemon juice. Stir and cook for 2 minutes more. Season with salt and pepper and more lemon juice, to taste. Cover to keep warm. Combine all of the ingredients into a large saucepan. Bring to a boil. Turn down and simmer about 30 minutes. Serve over rice with shredded cheese and sour cream or use as a base for a taco salad. Try as a topping for hot dogs and burgers. Light the grill. In a large bowl, combine the oregano, the basil, salt, black pepper, vinegar, and oil. Add the eggplant, zucchini, bell peppers, and onion and stir to coat. Grill the vegetables in batches, turning once, until lightly browned and tender, 10 to 15 minutes per batch. Spread the inside of each roll with 1 tablespoon of the pesto. Sandwich the grilled vegetables, lettuce, and tomatoes in the rolls. Heat oven to 400 degrees F. Cook ground beef and onion until beef is brown. Stir in barbecue sauce. Spoon into ungreased 13x9x2" baking dish. Sprinkle with cheese. Stir together baking mix, milk and eggs until blended. Pour over beef mixture. Bake 25-27 minutes or until crust is light golden brown. On a buffet menu, serve the chops with purchased vegetable fried rice or mashed potatoes. To serve a crowd, purchase one pork chop per person. Increase other ingredients as follows; to serve 8, use 2 cans of broth, 2 onions and 4 garlic cloves; for 16 servings use 4 cans of broth, 4 small onions and 8 garlic cloves. Put oil in frying pan and heat until hot. Brown the pork chops on both sides. Add the chicken broth, onions, garlic. Simmer on low heat for about an hour, do not allow to boil. In a large saucepan, saute onion and garlic in butter until the onions are transparent, about 10 minutes. Add the remaining ingredients. Bring to a boil. Reduce heat to low and simmer about 10 to 15 minutes. Remove from heat. Cook pasta and drain. In a large bowl, mix the pasta with the tomatoes, butter and pepperoni. Sprinkle with cheese and blend. Drain tomatoes well. Saute mushrooms in 1 tbl. olive oil and 1 tsp water in a hot skillet about 3 minutes until softened and water is evaporated. Brush pizza crust with 1 tbl olive oil. Arrange tomatoes and mushrooms on top. Sprinkle with dried herbs and cheese. Drizzle pizza with last tbl. of olive oil. Bake according to pizza crust package directions. FRUIT - You will about 3 cups of cut-up fruit. After cutting fruit, place pieces on paper towels to drain completely. Fresh is better then canned, try to avoid frozen fruit, too watery. Best choices are peaches, grapes, bananas, strawberries and kiwi. Mix ingredients for glaze and cook over medium heat until it boils and thickens. Cool. Spread cookie dough on buttered pizza pan. Bake 350 degrees for 10 minutes. Cool. With an electric mixer blend ingredients for sauce and spread over cooled dough. Arrange fruit on top and pour glaze over. Refrigerate. Bring to room temperature before serving. OPTIONAL: Preheat the oven to 350 F. Toast the nuts for 5 minutes, then coarsely chop them. In a small saucepan, combine the sugar, corn syrup and cream. Cook over medium heat, stirring frequently, until the mixture is smooth, about 5-6 minutes. Stir in butter, vanilla and pecans. Remove and cool completely. To serve: briefly reheat in microwave or serve at room temperature. Spoon over your favorite ice cream. Store leftovers in the refrigerator.